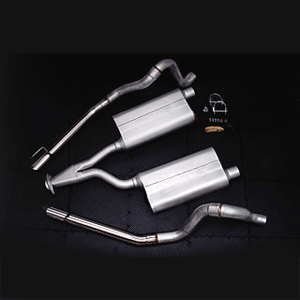 Flowmaster catback exhaust system for 1994-1997 Ford Mustang LX 3.8L features a 2.5 inch outlet, flanged Y pipe and hardware included, 50 Series Delta Flow mufflers, stainless style exhaust tips. **$9.99 Shipping Rate Does NOT Apply to this item** No one else gives you the bold clean styling of our Aftermarket Dress Ups, Suspension and Performance Parts for your American Muscle Car like UPR Products! Fits these Vehicles: 1994 1995 1996 1997 V6 Mustang Roush & Saleen Vehicles.